An American environmental group has criticised a UK power station over its use of biomass or wood pellets. Drax cuts down trees in the US and converts them to wood pellets to burn at its plant near Selby, in North Yorkshire. The Natural Resources Defense Council (NRDC) said the operation has become so large it "threatens to destroy ecosystems that can never be replaced". Drax denied this, saying the wood was "sustainably sourced". Andy Koss, Drax's Chief Executive, said: "We are very confident everything we do is sustainably sourced. "There are very strict regulations in the UK and Europe, we have to comply with these. All the biomass we source is audited as well." The NRDC report said energy markets were driving a "new and frenzied demand" for trees from the southeast of the US. Debbie Hammel, for the group, said: "The pellet facilities are located in areas where there is a very sensitive forest habitat." 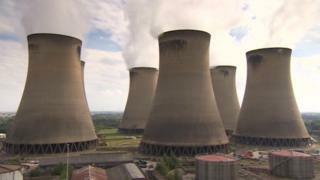 Drax has been converting half its boilers from coal to wood. It believes burning biomass means the carbon dioxide produced can be absorbed by planting new trees. The materials used include sustainable forestry and forestry residues, residual agricultural products, such as straw and purpose grown energy crops, Drax previously said. The power station uses about seven million tonnes of biomass pellets a year, much of it imported, particularly from the US.